USA; Fans on top of the Green Monster display a racism sign between the top and bottom of the fourth inning during a game between the Boston Red Sox and the Oakland Athletics at Fenway Park. Campaigners inspired by the Black Lives Matter movement unfurled an anti-racism banner at a Boston Red Sox baseball game on Wednesday before security guards escorted them from the ballpark, broadcast media said. 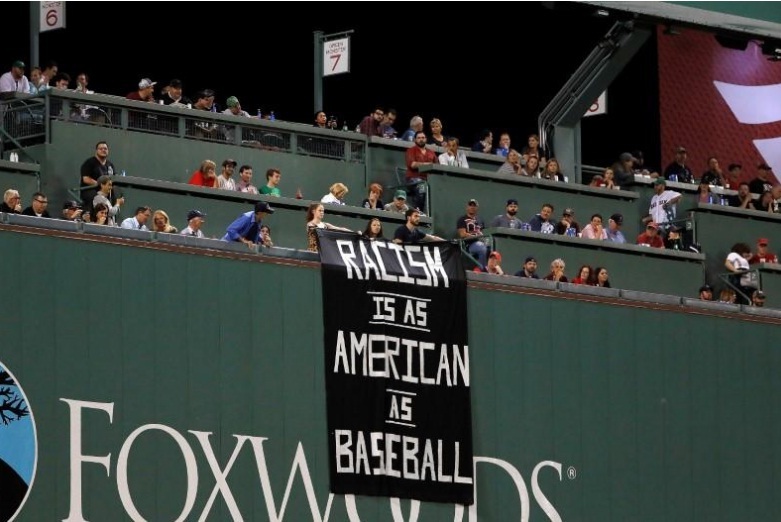 The banner, hung over the famed Green Monster wall at the Major League team’s Fenway Park stadium, read “Racism is as American as baseball”, ESPN reported. “Now a question to you: Baseball is racist. Do you support racism?” the group said in a Tweet. Wednesday’s banner was “in violation of the club’s policy prohibiting signs of any kind to be hung or affixed to the ballpark,” a Red Sox spokesperson told the sports network. It is named after former team owner Thomas Yawkey. Under his leadership, the Red Sox were the last major league team to field a black player, 12 years after Jackie Robinson broke baseball’s color barrier in 1947. The Oakland Athletics won Wednesday’s game 7-3.